Learning fun that suits children to a T! 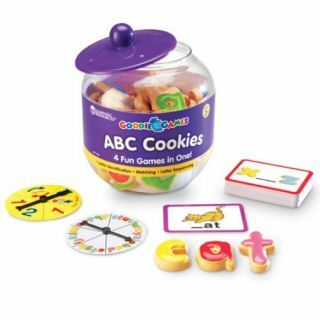 These pretend ABC cookies inspire creative play. Fun, easy and super–engaging game reinforces alphabet, letter recognition, beginning sounds, C–V–C word building and early vocabulary. Scaffolds learning through familiar picture cues, colorful game card borders and color–coded red vowels. Encourages early word building with a full lowercase alphabet plus extra high–frequency letters—42 lowercase alphabet cookies in all. Provides 4 leveled games that support and challenge early learners as they grow. Includes 45 double–sided self–checking cards, 2 spinners, Activity Guide, resealable jar and 42 colorful plastic alphabet cookies measuring approximately 2".